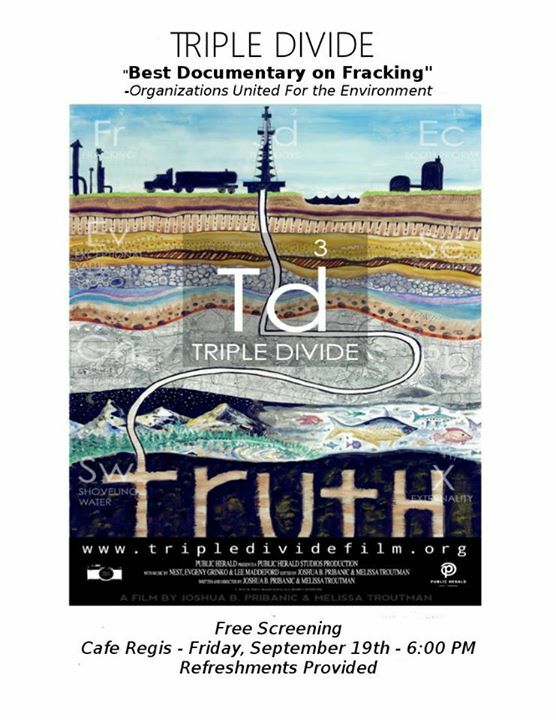 Followers of this blog will be pleased to know about a special free screening of the documentary film Triple Divide at the Cafe Regis in Red Lodge this Friday, September 19 at 6:00pm. The film’s creators, Joshua B. Pribanic and Melissa Troutman, will be on hand to discuss the film. At a recent public meeting in Red Lodge, ECA said these violations were a result of the company’s “misunderstanding” of state regulations. Whether you’re just becoming aware of this issue or you’ve been working on it for some time, this is an event worthy of your time. This entry was posted in Community Organization, Fracking Information, Politics and History and tagged Cafe Regis, Carbon County, Energy Corporation of America, Triple Divide, water contamination. Bookmark the permalink. One man or woman can send a Letter supported by an affidavit expressing his/her rights as granted by the Creator for clean air, clean water, and uninjured land. That Letter and affidavit in support of the letter can be addressed to each of the county commissioners as Respondents to the rights expressed by that one man or woman. The affidavit would contain language that failure to support the Creator-given rights for that man or woman and failure to rebut the facts in the affidavit within a prescribed period of time, point by point in writing with specificity under penalty of perjury is admission that the Respondent(s) agree(s) that said Respondent is bringing harm and injury to the man or woman and their estate. The Respondent is sent a notice of default and affidavit in support of the default with so many days to cure. When there is no response or an improper response that does not address the affidavits in a timely manner, point by point, in writing with specificity under penalty of perjury, then that man or woman has the basis for a claim for harm and injury to the man or woman and his/her estate in a federal court. These claims go to federal courts, not county courts. That is how one man or woman’s affidavit can be more powerful than 1000 signatures. Bring it to the personal level of harm and injury by a man (or woman) sitting on a commission or oil and gas board to the man or woman who has expressed the rights to clean air, clean water and uninjured land as granted by the Creator. If more than one man or woman do the same thing, then you have many claims being filed individually in federal court and not a class action claim that can be swept away as quickly as an oil and gas commission hearing can terminate the rights to a hearing.